I’ve been busy for the last week or so making some little Christmas goodies for my son Steve’s 5th grade class. I like to do this for him and he says the kids love what I send, so I’m happy to supply some fun little gifts for his students. This design actually comes from Whimsie Doodles and it’s in their freebie section. What a cute and easy little craft. I encourage you to head over and pick up the file if you have not already done so. There is even a video tutorial for making them. Even if you don’t have time this year, you’ll be ready to roll for next year. 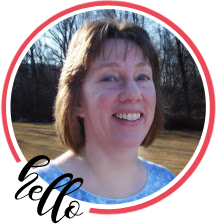 Take a look at the great digi images Melyssa offers while you are there. I love her style and she offers so many freebies and tutorials. So, this year I wanted to do something different. Pinterest is a great place to find ideas and I found several different ‘Grinch Pills’ options. I really wanted to do one with green tic tacs, but I could not find value packs of green tic tacs, so I had to go with m & m’s. Isn’t that adorable? Sadly I could not find any free files for the photo and poem printout for this type of favor in the right size and shape, but I was able to use the poem and a Grinch cartoon image I found online and merge them together to get what I wanted. It was a bit of a chore because I’m not a wiz on photoshop elements by any stretch of the imagination, but I got it done. Hopefully you will be able to save the image below and use it for your own projects. I have also included a quick tutorial below. I used this Grinch image because it’s one of our favorite scenes in the movie. And here’s a finished pack using the alternate image. I used a little longer zip loc bag and this one contains peanut m & m’s. You can also google Grinch pictures and find a whole range of options you can select to make your own special topper if you have the software to edit it yourself. I’m also sending a little Santa topped cookie pack for each child. re-sized it for my needs and cut the pieces out and assembled them. Seriously ladies, if you don’t already own this machine, it should be on your Christmas list. This is my favorite ‘big-girl toy’!! Supplies are shown below. 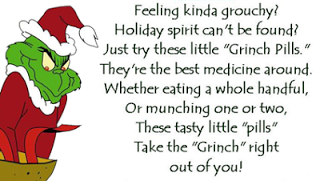 I printed the Grinch Pills image and poem above and cut it out at 1 7/8″ x 3-1/2″. The green card stock is cut at 2″ x 3-5/8″ and the stripe card stock is cut at 3-3/4″ x 5″. I used 3 x 3″ zip loc bags for my green m & m’s and the ribbon topper is a 10″ piece of scarlet red double-faced satin from Really Reasonable Ribbon. Fold the card stock in half and on the fold edge measure down about 1/4″ and make two holes about 3/8″ apart and centered on the piece. If you are going to be doing a large number of them, figure out where you want the holes and make a jig like I did above so you can just trace where the holes go on each piece. Then punch your holes out. Now get your 3/8″ Scarlet Double-Faced Satin (if you are just making one, use about 10″ of ribbon, if you are doing multiples, just work off of your long piece of ribbon to reduce waste). Cut the end on an angle and thread down through the right side hole and back up through the hole on the left. Now take the ribbon from the left and feed it down through the hole on the right side. Take a moment to work the ribbon a bit so it lays the way you want it so it will eventually lay straight out on the right side. Then bring the ribbon back up through the hole on the left. You want to leave a little ‘poofiness’ in the center, so don’t pull the ribbon too tight. Cut your ribbon at an angle on either side (or however you prefer it) and then I usually take a little micro glue dot (I’m not sure if you can see it below, but it’s near the end of the ribbon). Then place the ribbon end where you want it and that’s where it will stay. 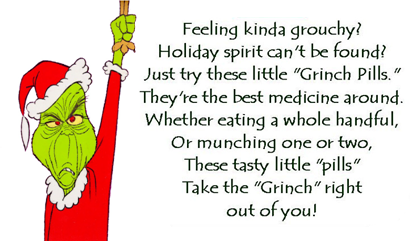 Now add the layered Grinch photo and poem to your piece and the topper is done. Open it up and run a piece of double-sided tape along the inside of the back flap that’s about 2-3/4″ long. Press your bag of m& m’s to the tape. I have my m & m’s in a 3 x 3″ zip loc baggie. Then add another piece of double stick tape to the top and press the topper together. And….. you’re done! If anyone has any questions, let me know. I’d be happy to help if I can. Here is a photo of all the ones I made – 23 in all (okay, well, 24 Grinch pill packs and 23 Santas). Right now his class is 20, but I like to send a couple extra just in case. You never know when he’ll get a new student. Here are some photos of all the goodies ready to ship off. Fingers crossed that they travel quickly and safely!! Thanks so much for stopping by and have a wonderful Christmas! Thanks for sharing your adorable creations as well as the images and tutorials for making them. I've bookmarked everything because I'm always looking for cute little gift items for teachers and kids at school. My daughter will be in middle school next year so that age kid LOVES the funny things like "snowman poop.!" Did you find a bag of green only M&Ms ? I found bulk m&m’s at a local party/wedding store. They had every color imaginable. Good to know. I separated the colors from a Christmas bag. But, then I got to eat the ones I didn’t need. It would have been way easier to just buy a bag with the right color though. Love the Grinch pills. If you are near a Party City, they sell bags of one colored m&ms! I MADE THESE FOR A CHRISTMAS PARTY GIFT. EVERYONE LOVED THEM! Hi Paula. I’m afraid I have no pre-made labels as I have never sold them. I would suggest you check etsy as they seem to have people who sell both the digital files and pre-printed toppers that are similar to what you found here. Happy crafting! Can you share link to find the 3×3 zip lock bags? Such a cute idea! I made these so long ago, I’m not really sure where I got the bags. It was likely on Ebay, so check there. Happy crafting!